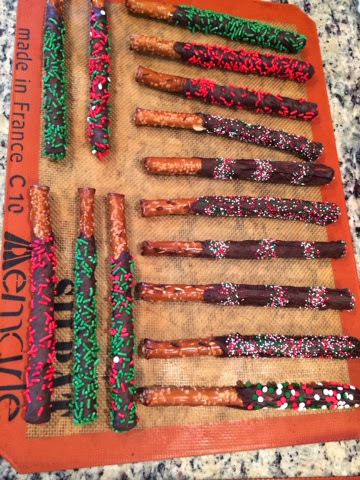 This year I decided to make chocolate dipped pretzel sticks. It was really easy, I made these during nap time today. All you need is a bag of pretzel sticks, bag of chocolate chips, coffee cup and plastic icing spatula. Fill coffee mug with chocolate chips and microwave for 30 seconds at a time. Stir every time until you get a creamy consistency. Then dip pretzel stick into chocolate. Hold the spatula against pretzel and turn pretzel. Move around and around inching down the pretzel stick until excess chocolate is swiped away. Sprinkle on some festive green and red sprinkles then place onto Silpat mat to harden. Once chocolate is hard place into container or treat bag. That's it!! Viola!! Beautiful handmade chocolate dipped pretzel stick treats to hand out this holiday.